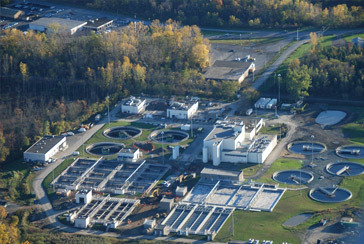 Saratoga Wastewater Treatment Facility - Mechanicville, N.Y. The scope of work included installing a new septage receiving station, an influent screen, a grit channel, influent pumps, three 140-foot-by- 40-foot rectangular primary clarifiers, four 136-foot-by-50-foot rectangular aeration structures, three 90-foot-diameter secondary clarifiers and a new ultraviolet disinfection system. Crews are modified existing secondary clarifiers and performed all sitework and piping infrastructure.